Charles Hazlewood’s All Star Collective, “A sort of avant-garde super group” – The Idler, is an ensemble dedicated to improvisation, featuring artists from across the musical spectrum. From Portishead’s Adrian Utley to former Jazz Warriors saxophonist Jason Yarde, from Goldfrapp’s Will Gregory to saxophonist Andy Sheppard to composer Graham Fitkin to drum & bass virtuoso Squarepusher, conductor Charles Hazlewood first assembled the band to play Glastonbury in 2008. They have reappeared at the festival multiple times since, most notably on the Park Stage with a blazing set of Barry Gray’s genius music for Thunderbirds, Joe 90, Captain Scarlet. 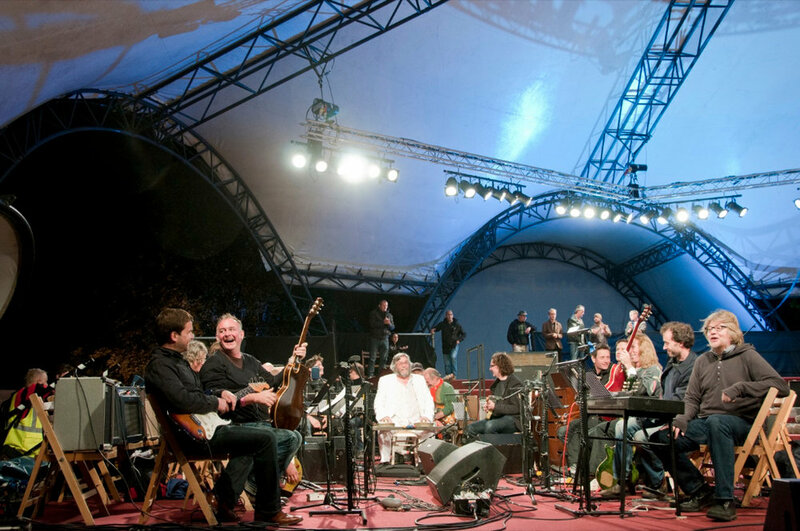 Their live ‘super group’ version of Oldfield’s Tubular Bells headlined the Spirit of 71 stage at Glastonbury, before playing the Queen Elizabeth Hall in London and the Sage Gateshead 2011, a reenactment of Oldfield’s own group performance, 38 years previously. In 2012 they played Riley’s Rainbow in Curved Air and participated in the festival of improvised performance at the Bristol Old Vic. They were also a mainstay of Hazlewood’s recent BBC films ‘The Magic of Minimalism’.